Jim Stoppani's Top 3 Exercise Tweaks For More Muscle! Make these subtle changes to a few of your favorite exercises to spark new size and strength gains! When it comes to the best exercises, I'm all for sticking to traditional exercises in their purest form rather than trying to reinvent the wheel just for the sake of change. But sometimes even classic mass-building moves can use a subtle tweak to become even better at stimulating growth. The following three ultrapopular exercises fall into this category. All are highly effective in their original states, but with the adjustments I recommend, they can be even better. By all means, don't abandon standard deadlifts, skullcrushers, and standing barbell curls; just give their sibling variations a try to ensure a well-rounded program that's destined to spark new gains. Why the Change? Research comparing the conventional and sumo-style deadlifts found that sumo-style increased the use of the inner and outer quads and inner hamstrings to a greater degree.1 This is due to the very wide stance used when deadlifting sumo-style, which causes you to bend your legs further, thus requiring more quad usage to straighten them. This can help you build bigger quads and inner hams, while the standard deadlift will help to build bigger outer hams and glutes. Research comparing the conventional and sumo-style deadlifts found that sumo-style increased the use of the inner and outer quads and inner hamstrings to a greater degree. Start: Stand over a loaded barbell resting on the floor with your shins touching the bar. Place your feet roughly twice as wide as you would for a standard deadlift—well outside shoulder width—with your toes pointed outward. Bend at the knees and hips, squatting down to grasp the bar with both hands using a shoulder-width, mixed grip—one palm facing forward, the other back. Your back should be as erect as possible, and your thighs should be close to parallel with the floor. Execution: Press through the floor with your legs, dragging the bar up your thighs until your legs are straight. Bring your shoulders back slightly and pause. Lower the barbell along the same path to the floor, close to your body all the way down. Touch the plates to the floor and immediately begin your next rep.
Why the Change? Doing skullies on an incline bench raises your arms higher overhead to place more stretch on the triceps long head, or the muscle on the back of your arm that provides width when viewed from the side. Placing more stress on this large triceps head means greater potential for arm growth! Take Pre JYM before workouts for increased energy, more strength, and a powerful pump! Go Now! Start: Lie back on an incline bench set to about 45 degrees, and hold an EZ-bar over your face with an overhand grip and your arms extended and perpendicular to the floor. Execution: Bend your arms to slowly lower the bar until it's behind your head, keeping your elbows in place as best you can. Don't let them flare out. Forcefully extend your elbows back until your arms are fully straightened, back to the start position. Why the Change? When you perform a biceps curl, the first half of the range of motion (from arms straight to arms bent about 90 degrees) primarily involves the brachialis, the muscle that lies underneath the biceps, and the brachioradialis, the forearm muscle on the thumb side of the arm. The biceps don't really kick in until the elbow is close to 90 degrees. In addition, your arm is weakest during the first half of the curl and strongest during the last half. When you do a full range of motion (ROM) curl, the weakest portion of the movement—the bottom half of the rep—limits the amount of weight you can use. By doing seated curls, which remove the bottom half of the rep, you're able to place a greater overload on the biceps. Most guys can curl about 20-30 percent more seated than when standing, and thus promote greater growth, when they're working only in the strongest part of the ROM. When you do a full range of motion (ROM) curl, the weakest portion of the movement—the bottom half of the rep—limits the amount of weight you can use. By doing seated curls, which remove the bottom half of the rep, you're able to place a greater overload on the biceps. Start: Sit on a short-back bench or the end of a flat bench with your feet planted firmly on the floor. Rest a straight bar or EZ-bar on the top of your thighs and hold the bar with an underhand, shoulder-width grip. Execution: Curl the bar up toward your shoulders, keeping your elbows in tight at your sides throughout. Slowly lower the weight to your thighs—don't let the bar fully rest on your legs between reps—and repeat for reps.
Shop Jim Stoppani’s Supplement Line! Cutting-edge ingredients and formulas, only on Bodybuilding.com. Go Now! Escamilla, R. F., Francisco, A. C., Kayes, A. V., Speer, K. P., & Moorman 3rd, C. T. (2002). An electromyographic analysis of sumo and conventional style deadlifts. Medicine and Science in Sports and Exercise, 34(4), 682-688. 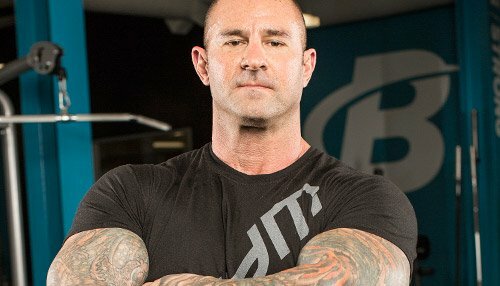 Photos and instructional videos of these exercises, as well as full training programs that implement them, can be found on my website JimStoppani.com.